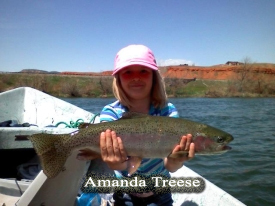 Bighorn River Outfitters offers guided fishing trips, scenic float trips, and if you prefer to float the river on your own we offer shuttle services as well. Fishing trips are half-day and full day trips, customized to fit your schedule. You will drift in McKinsey style drift boats that comfortably accommodate two anglers and a guide. You will cast from the boat while drifting and while anchored in deep runs and pools some wading can be done in the shallower runs. Fly fishing is highly recommended, but spin fishing is also very effective. Bighorn River Outfitters provides tippet and flies that will make your trip a success. 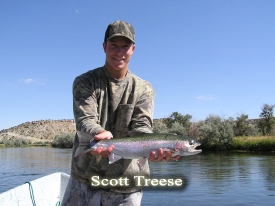 While fishing this beautiful river, you will pursue rainbow, brown, and cutthroat trout. The Big Horn River starts it's northerly flow in the Wind River Mountains, some 200 miles southwest of Thermopolis, under a different identity, the Wind River. The Wind River becomes a tailwater after being released from Boysen Dam some 13 miles south of Thermopolis. The name changes to the Big Horn River upon exiting Wind River Canyon, at the sacred "Wedding Of The Waters". The Big Horn River continues north into Montana, flowing into the Yellowstone River, then into the Missouri, ultimately ending up in the Pacific Ocean. 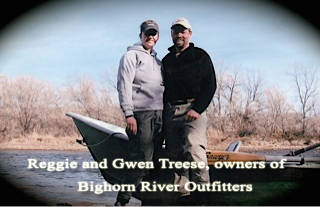 It's on this tremendous river, Reggie Treese owner and operator of Big Horn River Outfitters has dedicated his time to providing you with a fishing adventure of a lifetime. 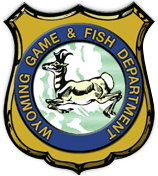 Reggie was born and raised in Wyoming and after fishing the Big Horn River in and around Thermopolis for over 40 years he has chosen to offer his services to share with you the excitement of fishing for wild trout. Reggie began operations in 1993 and the wealth of knowledge obtained over the years, will be shared with you, in the pursuit of trophy trout. So whether you are spin fishing or fly fishing, fishing nymphs, streamers or dries, Reggie will give you his promise that every cast has the potential for hooking a trophy of a lifetime, and with each cast, myself, and staff, will do all in our power to provide you with the trip you will cherish for a lifetime. Ready to book your trip? Click HERE to use our online contact form. Or give us a call at (307) 272-FISH. We look forward to hearing from you!